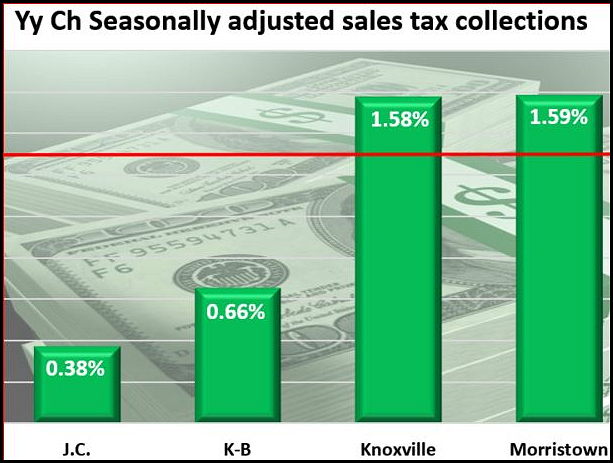 Northeast Tennessee sales tax collections rode a strong holiday sales season to close 2017 with a regional 1.29% annual increase. Annual seasonally adjusted collections in both Tri-Cities metro areas lagged the regional annual increase rate by better than half. It was also the weakest annual increase for both Tri-Cities metro areas since 2014. The Morristown Metropolitan Statistical Aras (MSA) led the region with a 1.59% annual increase by just edging out the Knoxville MSA’s 1.58% annual increase. Here in the Tri-Cities Kingsport-Bristol has a 0.66% annual increase while the Johnson City MSA had a 0.38% increase. The annual increase for Johnson City was a big dip from the 2016 3.8% annual increase and the 5% increase in 2015. It was also only the second time it has been below 1% since 2012. It’s much the same story in Kingsport-Bristol. Last year’s increase was paltry when compared to the annual increase in 2016, up 4.6%, and 2015, up 7.4%. The only year with less of an annual increase was 2013 when it was down 1%. While sales tax collections are growing in both the Johnson City and Kingsport-Bristol metro areas the growth rate is slowing. That’s best illustrated by the three-month moving average metric. 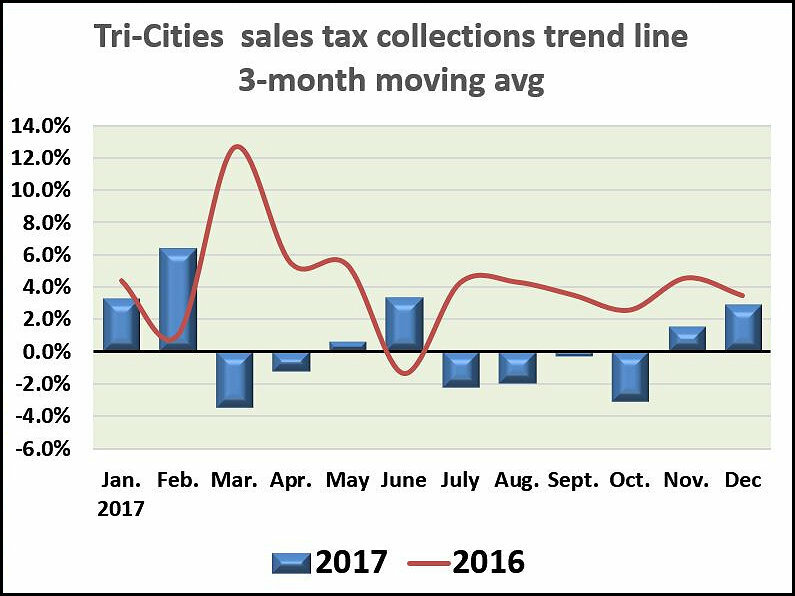 From that trends perspective, Tri-Cities sales tax collections lagged the 2016 three-month moving average five times last year. All but one of those negative months were July through October. Drilling down to the MSA level Johnson City’s collection trend was negative in May. In September it went negative again and stayed that way for the rest of the year. Kingsport-Bristol’s trend line also dipped below zero in May but recovered through August when it was negative for the next three months. Collections were positive in November and December. The Knoxville MSA has one negative mark on the three-month moving average metric. Morristown, which has the best annual increase, had a negative trend line began in September and lasted through December. It kept the top annual gain spot due to stronger performance in the first half of the year. Here’s how collections looked when compared to November.